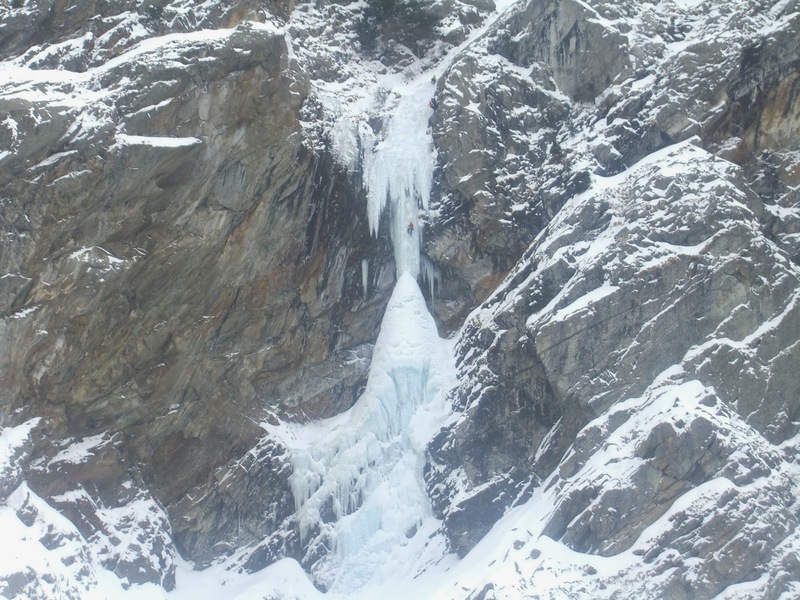 All the photos are from some of the harder lines in the Lillaz valley in Cogne on February 14, 2014. There were a lot of climbers on the hard routes despite the 20-40 cm of snow the day before. 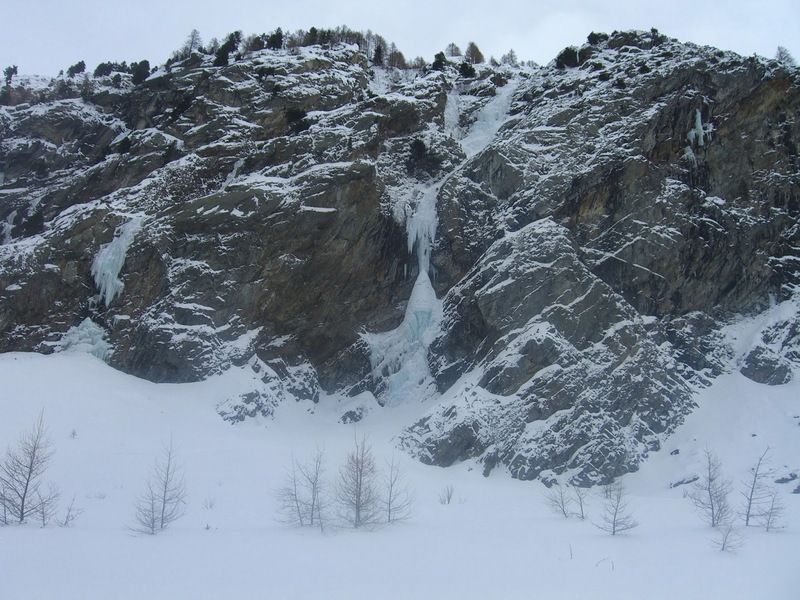 The avalanche danger was much lower that expected because of the influence of a föhn weather system. Thursday, 13th February ended with an in-between brief high pressure system with strong winds at around 22:00. The winds moved and deposited the snow in the small bowls, ravines and slopes in and under the ice falls. It beneficially cleaned the snow off of the rock faces and ice. On the negative side, the warm, damp air noticeably thined out the hanging ice, curtains and columns. Water was running on all the difficult climbs. The ice was relatively soft, even first thing in the morning. 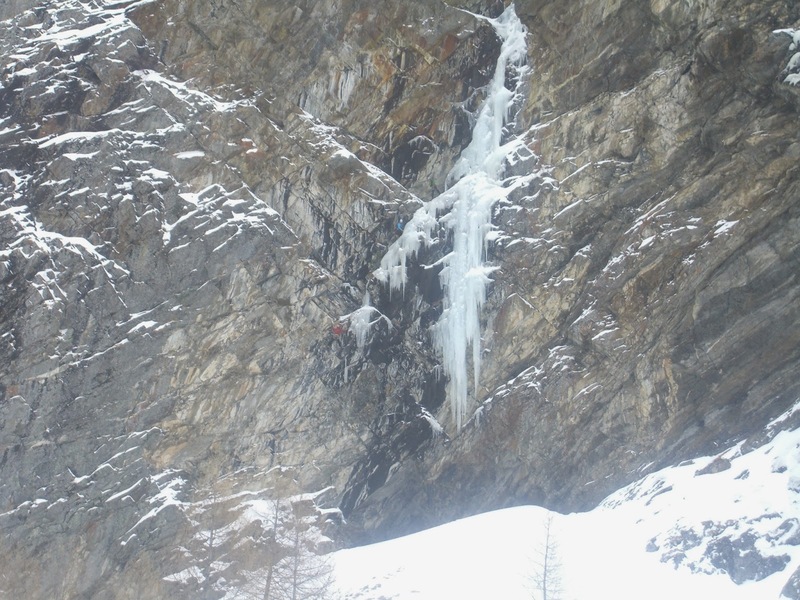 By far the biggest attraction at the moment in Cogne is the direct column of "Hard Ice in the Rock". 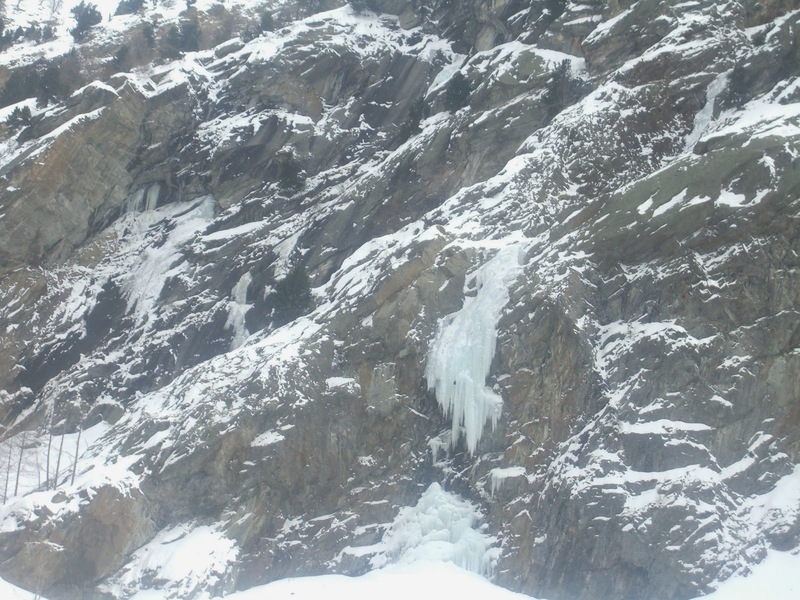 I have a feeling that all the French ice climbers in Chamonix have gotten word that it has formed and are coming over to get their WI6 route ticked-off. There were 4-5 French rope teams on "Hard Ice" which made it impossible for me to safely get on. It was a similar story with "Inachevee Conception". With so much hanging ice in these types of routes the danger of falling ice is just too great. Other, less popular routes that have formed, and are very attractive because there are fewer climbers vying for the ascent. There was one rope team working out the moves on "Gelati". Further in the vally, past "Stella Artice" and the roofs of "Inacevee Conception", the routes "A la memoire du bouquet in" WI5+/100m is in top condition (no one on it on Friday) and so is "Tchao Felix" WI5+, A1, X/300m. 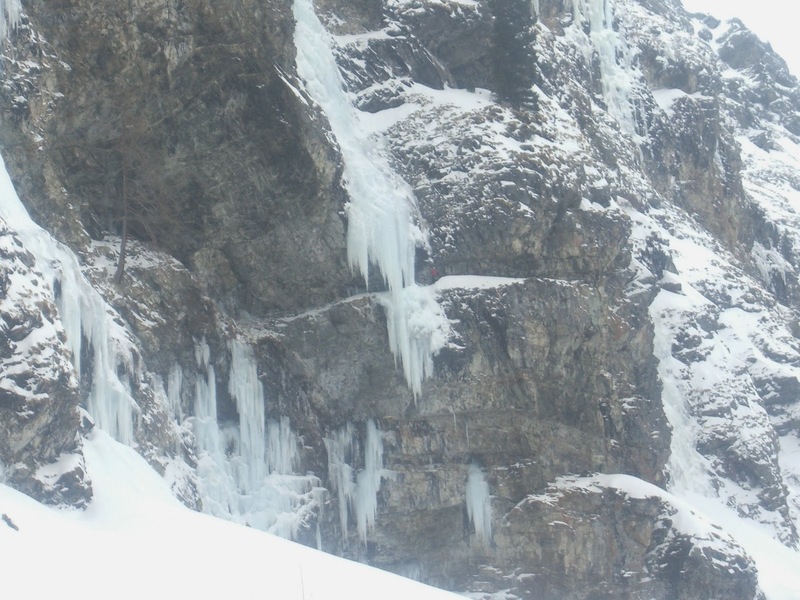 Because of the massiveness of the lower hanging ice, I think the climb is doable without the A1 move. There was a British couple working out the climb. There was also one rope team on the climb, "Riacamo" WI5+/100m which is between "Gelati" and "Hard Ice". "Riacamo" is thin but looks climbable and stable, but difficult to protect. Many of these routes were not formed when I was in Cogne in the 2013 season around the same time. Saturday, 15th February was overcast with a somewhat damp air mass but colder temps of -1 at 10:00 in the morning. Friday night was clear, but relatively warm. Because of the warm air mass and a bit of sun on Friday, the new snow has rapidly settled and is well bonded. The heavy föhn of Friday has thankfully lessened too. 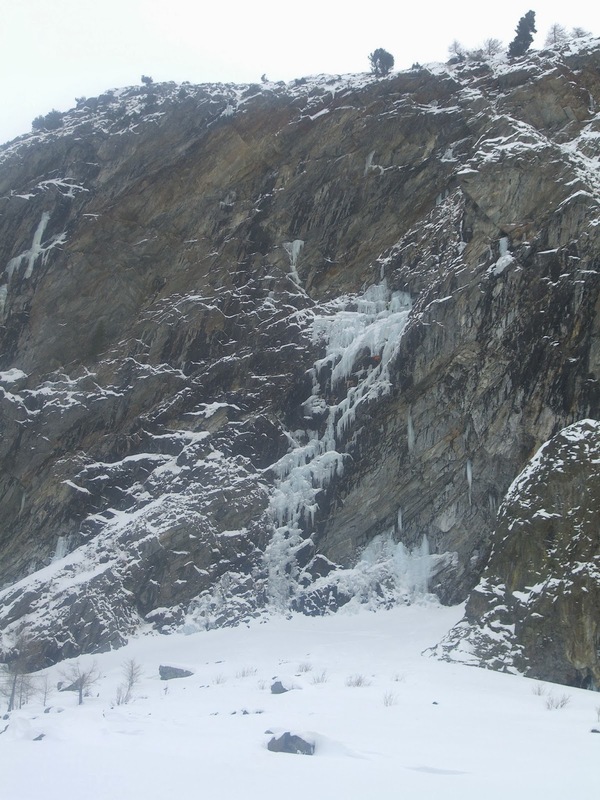 The ice on the harder climbs could use a bit of a growth/building phase, but all-in-all is in good shape.